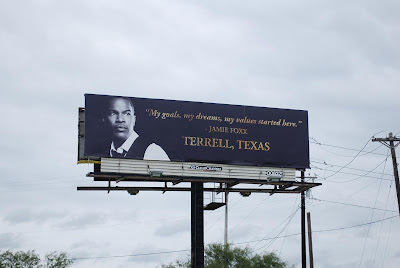 Tomorrow morning Terrell welcomes home Jamie Foxx. Beginning at 10AM, a parade will travel down Moore Ave. from City Hall to Memorial Stadium. A presentation will be made at the stadium honoring Jamie Foxx and presenting him with the key to the city. Expected to attend the ceremony will be Texas Gov. Rick Perry, State Senator Bob Duell and State Representative Betty Brown. Tricia of the Terrell Tribune has a great story about the visit. Tickets to the program at the stadium have already been distributed, but come out to Terrell, line Moore Ave. then stay and have lunch in town. How many times will get you the chance to see an Academy Award winner in person ? Click here for more Skywatch Friday. The Terrell Tigers begin district play tonight in Mesquite against the West Mesquite Wranglers. Cliff has a preview of the game. Game time is 7:30PM and can be heard on KPYK 1570-AM. The State Fair of Texas starts today. We normally wait and go during a weekday to avoid the crowds. Week 3 NFL picks - lets hope I can do better than last week.